Last fall, renewed optimism resounded across oil markets. 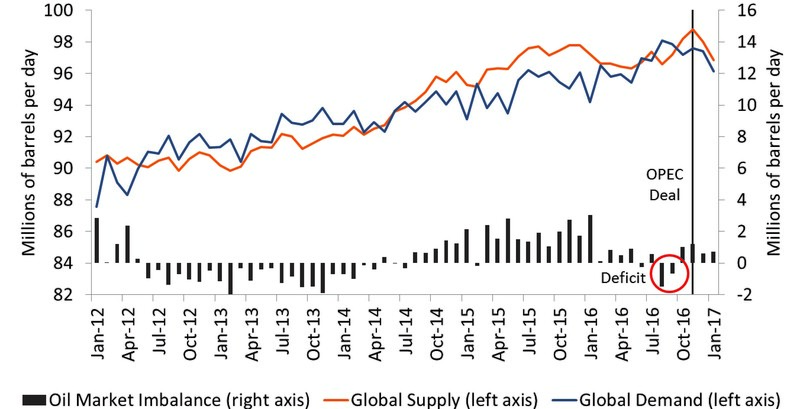 The North American rig count had fallen by almost 50% since January of 2016 and was a tiny fraction of where it stood prior to the oil price decline that began in mid-2014, foreshadowing weak supply growth. Moreover, the Organization of the Petroleum Exporting Countries (OPEC) appeared to finally be ready to take advantage of these lower levels of shale activity by cutting output and paving the way to a recovery in oil prices. North American oil prices jumped jubilantly when this action came to fruition and OPEC signed a major deal in which members agreed to curtail production. Steel is the largest metallic cost driver in energy supply chains. As such, its volatility over 2016 has led supply chain teams to look for ways to manage this cost and mitigate the potential impact of further large increases in the price of steel. In contrast to base metals like copper, aluminum, and nickel, which have deep and liquid financial derivatives markets, steel production and consumption is fragmented amongst differing grades. This has inhibited the development of a robust hedging market for steel. Indeed, volume and open interest in exchange-listed steel contracts looks miniscule relative to major base metals benchmarks. While steel is admittedly a relatively expensive and difficult commodity to hedge, this post examines the cost and efficacy of options available to American firms wishing to mitigate their steel exposures. As oil prices began falling in mid-2014, oil market observers naturally assumed that OPEC would play its traditional role and cut production in order to stabilize prices. However, since then, the group has failed to implement any meaningful cuts, contributing to a massive global supply glut and a bear market in crude. While this course of action is partially a response to the economics of US shale plays, it has been driven by internal clashes within OPEC, particularly between Saudi Arabia and Iran.